Winner of the" Air Europa Classical Act of the Year Award 2013", lyric coloratura soprano Gabriella Di Laccio enjoys an international career that spans the genres of opera, oratorio and chamber music.Vencedora Especially known for her virtuoso voice and much sought after in Baroque music she is also a devoted a performer of Contemporary repertoire. Bringing freshness to older music and authority to new, Gabriella brings intensity to her performance, which transcends the traditional boundaries of classical music, introducing new and exuberant flavour and charisma. Equally at home on the recital stage, Gabriella performs regularly as a solo recitalist and as a member of various chamber groups and has appeared in a number of major London platforms including Wigmore Hall, Purcell Room, Southbank Centre, Megaron Opera House, St. John's Smith Square, Banqueting House White ha I I, Theatre des Varietes Monaco. As a performer of the baroque repertoire she has sung with the Amaryllis Consort, II Festino, Concerto lnstrumentale, Di Profundis, Baroque Orchestra of Mercosur and Baroque Ensemble Florilegium. In November 2018, she was listed of the BBC's 100 most inspirational and influential women in the world. Harpsichordist, teacher and researcher, Fernando Cordell a is the founder member of the Baroque Ensembles Cape la Strumentale, as well as artitsic director of Sociedade Bach Porto Alegre and Orquestra de Camara de Carazinho. 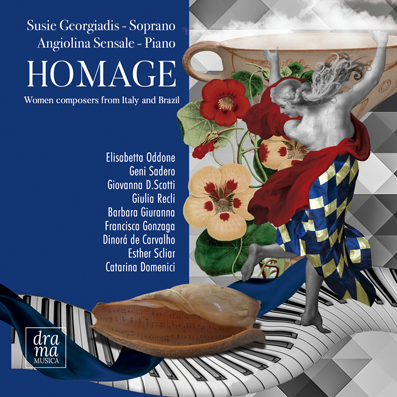 Cordelia has been performing as a soloist and as a harpsichord continuo player in various Brazilian orchestras conducted by Peter van Heyghen (Begica), Rodolfo Richter (lnglaterra), Luis Otavio Santos, Emmanuele Baldini, Juan Manuel Quintana (Argentina), Roman Garrioud (Fran􀀒a), Michaela Comberti (lnglaterra), amongst others. Among his recordings some that stand out are Mozart's Requiem with the Baroque Orchestra of Early Music of Juiz de Fora Festival, conducted by Luis Otavio Santos; Vivaldi's Concerti Per Archi, with Ouro Preto Orchestra, conducted by Rodrigo Toffolo, and his solo CD "Harpsichords -from Frescobaldi to Mozart for StudioClio. Early music ensemble devoted to the performance of music from the 17th and 18th centuries on period instruments. The ensemble's aim is to recapture the intimacy, passion and energy of music when it was first composed. The group consists of internationally renowned baroque specialists who meet up several times a year and work together to prepare and perform new exciting programs. The outstanding talent and musical imagination of all players makes each concert a new experience always full of energy and enthusiasm with combined with a profound understanding of music as it was originally performed.